This is my phone. I LOVE my phone. I LOVE blackberry and the creators. They are awesome. OK seriously, I'm addicted to my phone, or as many blackberry users say, crackberry! I feel that if I do not have my phone with me, my life is done. Many people have blackberry phones because their jobs give it to them so they can work "more efficient." 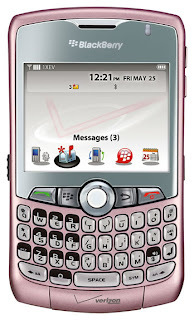 My case is not so, I have a blackberry as a PERSONAL phone because my life revolves around my calendar. And since us humans spend at least 40 hours a week at work, I input everything into my calendar at work via Outlook. So, I am able to sync my blackberry to my work calendar which includes my personal appointments. Now, what's real funny is that I have a work phone as well. The work phone is a Motorola razor. My blackberry sleeps next to me on the window sill, is usually always by my side and my best friend. Is it sad that I am addicted? I say no because every other person I know most likely owns a blackberry and they have the same symptoms I do. So, we think we are all normal. But what is even more hilarious is that there is a site dedicated for us. Take a look at the crackberry site. haha I love how you said that your blackberry was your best friend and other people have the same symptoms of you. It's almost like you're not even talking about your phone. It's kind of sad how much we rely on technology these days aw well.